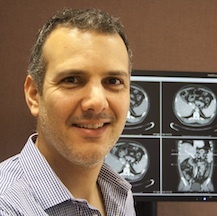 Dr Adrian Andreou qualified from the University of Manchester in 2001 and obtained Membership of the Royal College of Physicians prior to specialising in Radiology. Adrian completed his training at the Norwich Radiology Academy, following which he undertook a fellowship in oncological imaging at the Royal Marsden Hospital, London. He is currently practising as a Consultant Radiologist at the Royal United Hospital , Bath. His major interests are gastrointestinal and genitourinary imaging with a particular focus on oncological imaging.